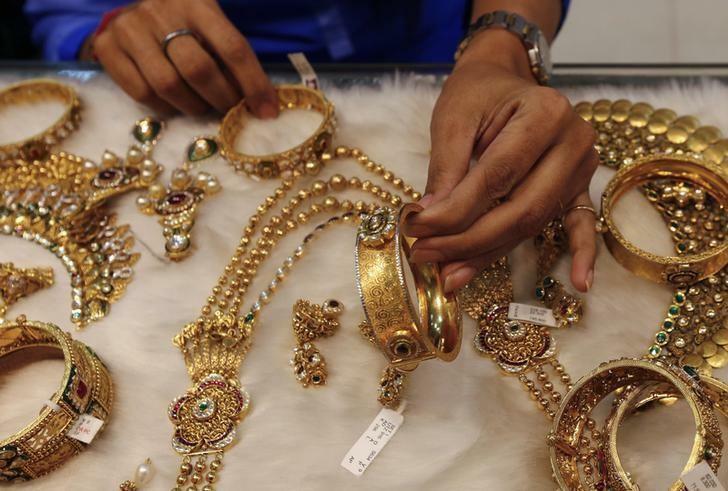 NEW DELHI (Reuters) - Indian jewellers threatened on Monday to go on strike over a government plan that would require customers to quote their tax code for major purchases as part of a clampdown on the black economy. Jewellers say about 80 percent of the $122 billion industry's business comes from rural customers, mainly in the agriculture sector, who lack a so-called permanent account number (PAN), which is used to prevent tax evasion. Presenting his budget on Feb. 28 for the next fiscal year that starts on April 1, Finance Minister Arun Jaitley said PAN would become compulsory for sales of more than 100,000 rupees ($1,592) to prevent the circulation of "black money" - a key political challenge for Prime Minister Narendra Modi's 10-month-old government. However, the All India Gems and Jewellery Trade Federation (GJF), a grouping of 600,000 businesses, denied that illegal money was rife in the jewellery industry where artisans add value to gold coins and bars. GJF's chairman-elect called for talks with the government and said the federation's members would not wait too long before taking to the streets again, as they did in a three-week strike in 2012 that forced a rollback of a levy on unbranded jewellery. "This is a very strong organisation and all of us are together," Manish Jain told a press conference. "As of now we are pacifying our members. But we want conversations with the government and have sought time from the finance minister." The Finance Ministry could not be reached for comment. No businessperson likes to lose a customer, so paper-less dealings will rise with those who do not have a PAN, Jain said. The alternative of asking customers to show a government-issued identity card and fill out a form would contradict Modi's stated intention of making it easier to do business in India, Jain added. A panel of the Reserve Bank of India said in 2013 that even the previous rule of furnishing a PAN number for transactions above 500,000 rupees was not fool-proof and "many jewellery shops flout that norm with impunity". Indians buy an average of 2.3 tonnes of jewellery a day and imports can hit up to 1,000 tonnes a year, the highest in the world, draining foreign currency and boosting smuggling.